A low-carb diet is one method that many people have found helpful for weight loss. A decrease in carbohydrates in the diet and a greater focus on fats and protein may result in lower insulin levels, which can cause the body to burn stored fat. If you are making the transition to low carbohydrate foods, you may want to spend some time transforming your pantry and kitchen cupboards into a low-carb environment. Its time to give all those cookies, crackers, packaged snacks, cans of beans and jars of fruit to a friend or neighbor. Stocking your shelves with low carbohydrate canned foods can make it easier to go low-carb. When looking for canned foods to include, focus on meats, poultry, fish and some vegetables. Fruit, beans, pasta, corn and starchy vegetables such as potatoes, beets and carrots should be avoided. 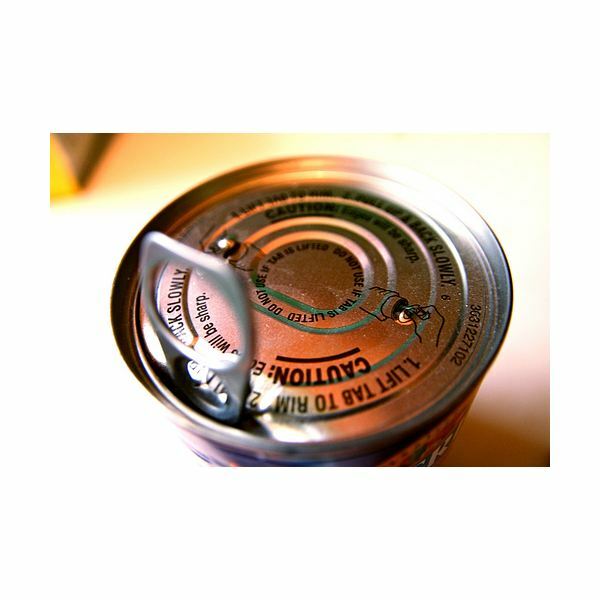 The following are all great canned foods to include for a healthy low-carb diet. Canned tuna is a great part of a healthy diet. It is very high in protein and a great source of healthy omega-3 fatty acids. One ounce contains one gram of fat, seven grams of protein and no carbohydrates. Tuna is also rich in minerals including selenium, magnesium and potassium. For a higher omega-3 content, choose canned tuna that is packed in water, not oil. Choose tuna with a lower salt content. Look for specialty brands that sell Premium Albacore tuna, rather than the big commercial brands. Some of the smaller fisheries catch the fresh fish in cold waters, freezing immediately. Commercial fisheries use long lines, where fish may be caught and waiting an entire day before being harvested. They also cook their fish twice, which reduces the nutrient content. How can you enjoy canned tuna? Try making a healthy tuna salad with eggs, chopped celery and creamy avocado. Serve over a green salad for a healthy, low-carb lunch or dinner. Canned chicken is another excellent food choice to include in your pantry. It is inexpensive and high in protein and flavor. One ounce contains two grams of fat, seven grams of protein and no carbohydrates. It is also easy to cook with. Look for natural products that are low in sodium such as Valley Fresh. To use, simply drain the water and add to recipes or add to fresh salad greens for a source of protein. Make a low-carb soup with chicken or vegetable broth, canned chicken, fresh tomatoes, mushrooms and asparagus. Tomatoes are great low-carb vegetables and they are also an excellent canned veggie. Unlike other vegetables such as broccoli and cauliflower, tomatoes retain much of their nutritional content no matter how they are prepared. Tomatoes are high in antioxidants such as lycopene and vitamin C. They are also an important source of fiber. A one ounce serving of crushed, canned tomatoes contains no fat, no protein and only two grams of carbs, one of which is dietary fiber. Use this low carbohydrate canned food in soups and sauces. High in important nutrients such as vitamin C, vitamin A, iron and folic acid, keeping a can of asparagus in your pantry is always a good idea. This vegetable is also an excellent source of fiber. One cup of canned asparagus provides two grams of fat, five grams of protein and six grams of carbohydrates, four of which are dietary fiber. Canned asparagus is soft, as opposed to fresh asparagus. Heat gently and mix with other veggies and serve with a piece of chicken, fish or meat. Fold into an omelet with a little cheese. Canned asparagus is also great in soups. Be careful however as this food is very high in sodium. If you are eating canned asparagus you may want to avoid other canned foods in the same meal. There are other great low carbohydrate canned foods that you should add to your kitchen pantry. Artichoke hearts, cauliflower, turnip greens, mushrooms and Brussels sprouts are great vegetable choices. Canned mackerel, sardines and anchovies are other excellent sources of protein. When choosing canned goods, always look for low-sodium products. Canned foods tend to be very high in sodium. Be aware of this and do not consume too many canned products at once. Try to integrate your low-carb canned veggies or fish with fresh vegetables, meats, dairy and eggs. Also look for more natural products that have less processing. Canned goods tend to be less expensive than fresh products. Spend a little more for a high-quality food from a smaller brand that focuses on quality and nutrition. Commercial products are less expensive because they are mass-produced, which means the focus is quantity, not quality. While a low-carb diet can be helpful for weight loss, be sure you are still getting enough nutrition and eating a balance of foods. Include fresh nuts and seeds, goat cheeses, eggs and lots of vegetables in your diet. Consider integrating some fruits and whole grains after a period of time.